The CIE chromaticy chart is one of the things we are headed for. Here is a black-and-white drawing of its boundary. I’ll show you later how I got it. 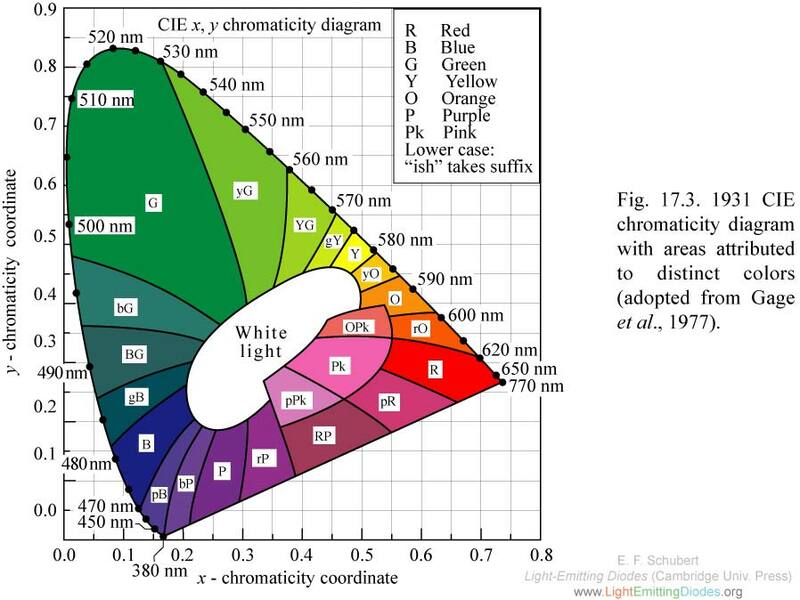 You should be able to find color versions of the CIE chromaticity chart (1931) all over the Internet. Here’s one that shows some curves of constant hue. I’ll point out now that these curves are not straight lines. I will also use that image to decide that something is a greenish-yellow or yellow-green. Wikipedia seems to have a lot of information, such as this, for example. What my drawing shows is that I can reproduce the analytical content of it. Black and white, but no color. I have four tables of data, from Wyszecki and Stiles, for which see the bibliography; and I will abbreviate them “w&s” in this post. We also have “xyz” chromaticity coordinates (row sums = 1), and “xyz bar” color-matching functions. All 4 tables are at 5 nm intervals from 380 to 780. Well, these 4 tables come in a variety of sets. I chose to use the 1931 tables at 5 nm intervals. They have been interpolated to 1 nm intervals. They have been corrected by several authors in different ways. They were re-done in 1964 by the CIE to use a 10° field instead of the 2° field of the 1931 standard. My choice of the uncorrected 5 nm 1931 standard is not universal — but it is an extremely common choice, and an awful lot of the work done since 1931 has used it. At my level of usage, it probably doesn’t matter a whole lot. In fact, a whole lot of other things will turn out to be more important. My source for the tables, as I said, was w&s. I am not going to reproduce them — as far as I can see the CIE charges for some of them — but I wouldn’t be surprised if you can find them on the Internet. In principle, three of the tables are secondary. Their source is the table of rgb bar. First, let me show you what they look like. Here is a picture of the rbar, gbar, bbar data. The x-axis runs through wavelengths from 380-780, the points are 5 nm apart. It is clear that rbar is significantly negative over part of its range (440-545 nm); it is true, but not clear, that gbar is very slightly negative over 380-435, and bbar is very slightly negative over 550-655 — and it’s shown as 0 for longer wavelengths. In fact, at any given wavelength, exactly one of the three is negative; nevertheless, only the red rbar gets seriously negative. What do these negative numbers mean? I suspect that the simple description of the color matching experiment is too simple experimentally, but I also believe it suffices in principle. Imagine that you are looking at a split screen, at two halves of a colored disk. The left half of the disk is a monochromatic color. (Think of a tunable laser — but of course they didn’t have lasers in the 1920s when the experiments were done!) The right half of the disk is controlled by the viewer, who has three dials and may choose mixtures of red, green, and blue in order to make the two halves of the disk match. It turns out that we can’t do that. Over most of the range, we have to change the color of the left half of the disk as well as the right half. We can’t match a wavelength of 380 nm (the violet end of the visble spectrum) with red, green, and blue. But if we add a tiny of green to the violet, we can match that combination with red and blue. We record a negative number for green at that wavelength. Until the blue goes to zero thru negative values, exactly one of the 3 numbers is negative. At long wavelengths, when blue is zero, we just use red and green. So much for the negative values. Oh, having said that I will not reproduce the table, I will present — so you can do these calculations yourself — one quarter of it. Here is the rgb bar table at 20-nm intervals. The second table, rgb, is derived from the first in principle — but not in practice! In principle, take the rgb bar table and recsale it by setting every row sum to 1. In parctice, we don’t have enough digits to do that. They provide a table. It is called the rgb (chromaticity coordinates). Here is what the rgb table looks like at 5 nm intervals. And here is a subset of the rgb table, at 20-nm intervals. which sum to 0.00119 . That’s two of the four tables. As it happens, they’re the two we may be able to dispense with in practice — but in principle, rgb bar is the starting point. Let me emphasize that these values depend on a specific choice of red, green, and blue. The CIE defined a specific change-of-basis. The tri-stimulus coordinates (rbar, gbar, bbar) or (R,G,B) are a vector in R^3; they defined a vector denoted either (xbar, ybar, zbar) or (X,Y,Z). Oh, although the table is denoted rgb bar, specific coordinates wrt it are usually denoted RGB; similarly, specific coordinates wrt the xyz bar table are usually denoted upper-case XYZ. Bear in mind that these RGB are not the same as coordinates in RGB-color space. (The latter is bounded by 0 and 1; the former is not!) We’ll see more about this down the road. Still… raise your hands and step away from the keyboard. What we just did was apply their matrix T to RGB components to get XYZ components. Perfectly natural. But we know that the transition matrix delivers old components when it is applied to new ones. If we want to call that given matrix T the transition matrix, then we must think of XYZ as the old components. In practice, this really just means that we better know which way the transformation goes. They gave us the transition matrix for old components XYZ and new components RGB — even though they derived the XYZ basis from the RGB basis. OK? If not, please be patient. Now just where did that change-of-basis transformation come from? Malacara has a readable discussion. The most important point, to my mind, is that the Y column vector, the second column, is chosen to be the “phototopic response” (1924) of the human eye, that is, daylight vision, that is, color vision. There’s not much point in my digging out that data and plotting it: it is exactly the green curve in the drawing of the xyz bar table. Second, all the values X,Y,Z are non-negative. Third, they also set the column sums almost equal to the value for the Y column. There was another criterion, but I’ll show it to you after I show you the fourth table. Table 4 comes from table 3 as table 2 comes from table 1: get table 4 by setting the row sums of table 3 to 1, just as we got table 2 by setting row sums of table 1 to 1. All in principle, of course, or having more digits available than were printed. Ok, here’s the next major idea. Since x+y+z = 1, this table is essentially 2D, and we can plot y vs x. That is exactly the picture I started this post with, the boundary of the chromaticity chart. That’s all it is: take the first two columns of the xyz table, read each row as (x,y) coordinates, and plot each row. The fourth criterion was to make the line x+y = 1 tangent to the curve. (In fact, the earlier criterion about X,Y,Z being non-negative was implemented by setting the y-axis tangent to the boundary. So, 4 tables, one 2D chart. We could also draw a 2D chart of g vs r, or b vs r, from the rgb table, since its rows each sum to 1. What we have lost, in that chart, is the intensity. To recover XYZ from xy, we would need, for example, xyY; x,y and any one of X, Y, or Z would suffice. Let me start using that chart right now. We have RGB basis vectors (1,0,0), (0,1,0), and (0,0,1}. What are their (x,y) coordinates? There are a few ways to do this. Given the scale at which we are working, the easiest is to interpolate the x,y coordinates from the xyz table at wavelengths 435.8, 546.1, and 700 (that last one is a table value). Let’ s plot them on the chromaticity chart… and let’s draw lines connecting them. Think back to simplices. All of the points inside (and on) that triangle can be written as linear combinations of the coordinates of the 3 vertices; most importantly, the coefficients of those linear combinations are between 0 and 1, inclusive. That is, when the coefficients are in the closed interval [0,1], the combination is inside or on the triangle. That restriction to [0,1] is what restricts us to the inside (and on) the triangle. That triangle is said to describe the gamut of these three R,G,B vertices. The points outside the triangle have either negative coefficients (or perhaps coefficients larger than 1; I’m not sure). This is why we have negative values inside the primary table, rgb bar: all the points on the curved boundary are outside, or just on, the rgb bar triangle. That triangle is said to to show the gamut of those choices for R,G,B primaries. One of the most common uses of the chromaticity chart is to compare gamuts. A TV with these phosphors can reproduce colors in the red triangle. Whatever these are, they can only produce the comparatively limited set of colors bounded by the green triangle. To reproduce the entire CIE chart, within a triangle — i.e. with linear combinations having components in [0,1], we would need to have B at x,y = (0,0), R at x,y = (1,0), and G at x,y = (1,0). Easy enough to draw, but don’t ask me how to get such sources physically. A different form of the same principle — linear combinations of vectors — leads to the idea of mixing two colors. That is, instead of looking at all that can be produced by a particular set of RGB phosphors, we take two points and consider the line joining them. A particularly useful choice is when one of the points is defined as “white”. Here are the x,y coordinates of a white known as D65, a standard form of “daylight”; here also are x,y coordinates of a form of green (from Andrew Glassner’s “Principles of Digital Image Synthesis”, volume 2, Appendix G; Morgan kaufmann, 1995), known as “foliage” on the MacBeth Color Checker. line[t_] := t pf + (1 – t) p65. Like our discussion of triangles, if t is restricted to [0,1], then we get the line segment bounded by the two points. Only if we let t range outside [0,1] do we get line segments that extend beyond the two points. But I’d rather do something else: extend the line to the boundary, and consider the green point to be a combination of the white point and the boundary point. It is crucial that the XYZ values are independent of any particular RGB values. Of course, they originally came from the spectrallly pure ones — but once we have the XYZ basis, we can go to any other RGB basis we choose. Having seen other gamuts, we should expect that people get XYZ values from a spectrum. I’ll show you that next. How can i get RGB values (0-255 ; as in MS Word) from CIE (x,y) values. p.s.- I understand that two values are given and we need three values . Thanks for asking, …. There are three parts to this answer. First, you must be given 3 values, not 2. The most customary set is xyY, but x,y and any one of X, Y, or Z would suffice. In your case, with x and y so close to 1/3, the color is a neutral, but without Y (or X or Z) you can’t tell whether it’s white, black, or any gray in between. z = 1 – x – y. Z = z sum = z Y / y. At this point we have a device-independent specification: X, Y, Z for the standard observer. As we saw here (https://rip94550.wordpress.com/2009/11/15/transition-matrix-to-be-or-not-to-be/), that is not exact — and it can’t be, because the RGB and XYZ spaces are not exactly the same 3D subpsaces of R^81 (81 wavelengths from 380 to 780 at 5 nm intervals), but it’s what we are given. Because the transition matrix T31 is from RGB to XYZ, we convert from XYZ to RGB by using the inverse of T31. and that is what the rgb bar tables show at 500 nm. We may not like the negative value of R, but what it says is that this color is out of gamut for the three primaries they used – that what was matched was not this color, but this color plus red. In other words, the three CIE primaries cannot produce this color. I have not yet played with device RGB, so this is about all I can say confidently, at this time. Okay, I said I was working it out for one of many possibilities, and that I was ignorant of device RGB — what I didn’t say was that I was working it out for the only possibility which I knew to be linear. There may be other linear cases, but I don’t know of any yet. More to the point, it appears that — despite all the linear transformations I’ve seen — some if not all device transformations are nonlinear to some extent. The general answer is that the purpose of an ICC device profile is precisely that: to translate between the device RGB and CIE XYZ (or between the device RGB and CIE Lab). And that ICC profile (or profiles) is what you need to use, for whatever device (or devices) you’re focusing on. I find that answer less than satisfying for two reasons. Second, I am shocked — shocked and embarrassed — to discover, after all the linear algebra I’ve seen people using, that there are significant fundamental nonlinearities in color. Where I expected to find a simple change-of-basis transformation for my monitor, I seem to have found a nonlinear transformation. And I now wonder if the triangles everyone draws on the CIE chromaticity chart — to show device gamut, what we can produce from the primaries at the vertices — are approximations, not the full truth. What i want to know is exactly where those nonlinearities arise. While I continue to investigate these nonlinearities, I will confine myself — as I hope I have — to CIE XYZ, and perhaps its change-of-basis CIE RGB. By ignoring device RGB, I stay on the high ground instead of plunging into the canyon of ignorance. But, of course, I do need to explore the canyon. While drafting this, I have found a calculation for the change-of-basis for the NTSC phosphors and a particular white point — and it raises some very intriguing possibilities. When I understand it, I should show it to you. But the key point of this comment can be summarized as: I’m not at all sure that the linear transformation I have seen for NTSC is the full truth. Can you tell me how exactly you get rgb table for rgbbar table, as you told they are close but not the same? If I understand your question, you want to know why I said the rgb table is derived differently in practice than in principle. That’s an excellent question, and I must revise my statement. My post shows that the published 5 nm rgb table cannot be computed exactly by setting each row sum in the rgb bar table to 1. My counterexample is for the 380 nm row. My statement is correct for the 5 nm tables: if you start from the 5 nm rgb bar tables and normalize the rows to 1, you will be close to but not exactly match the published rgb table. But a quick check – the corresponding numbers for the 1 nm tables at 380 nm – is off by only .00001 for the blue column., and exact to 5 places for red and green. Now, confirming one line doesn’t prove that the entire tables are consistent – but I no longer have any reason to doubt them. For the 1 nm tables. This is crucial. The 5 nm tables – at least in Wyszecki & Stiles – show fewer places than the 1 nm tables. Since I never use the 1 nm tables, I don’t have any easy way, nor any reason, to check them all. In summary: until I have reason to believe otherwise, I will take it that, yes, we can compute the rgb table from the rgb bar table at 1 nm intervals – but not at 5 nm intervals. If this wasn’t your question (! ), please ask again. But in any case, it was a good question for me. Can you tell me how to prove that the gamut of colors generated by three primaries is a triangle formed by those primaries in the CIE chromaticity diagram. Well, I can think of a couple of ways to show it. at least implicitly. Basically, geometry yells us that any weighted combination of the 3 points r, g, b — with weights between 0 and 1 — is the coordinates of a point inside or on the triangle whose vertices are those 3 points. The weights are limited because we assume we cannot take more that 1 times any phosphor. On the other hand, we haven’t really justified taking weighted sums of the xy coordinates. The chromaticity chart in NOT constant intensity, so maybe we should go back to the XYZ values for each phosphor, take a weighted sum of them, and show that the resulting xy must lie in or on the triangle. I haven’t worked that out, so you might let me know if it doesn’t work. If the incident light is monochrome,f(u)= impulse at T=0.4 , what are the RGB tristimulus values generated? What are the CIE XYZ tristimulus values? where R(u) is given such that it starts from .25 to .75 on u (amplitude 0 at .25 and raises to amplitude 1 at .75)and then from amplitude 1 at .75 it drops to 0 at 1, therefore forming a triangle with base from .25 to 1 on u. 3. Adopted a Decayment Factor in Light Intensity : 1.0, 0.9, 0.8, … 0.1 to get the SS. He says exactly the opposite ! What I’m doing wrong to get exactly the opposite? Is the Faber Birren’s Law erroneous? the shift is either to blue or yellow depending on whether you are already closer to blue or yellow (below or above 500 nm). That effect, the Bezold-Brucke effect, may not be quite the same as part of an object being in shadow. And it’s quite different from an object being viewed at borderline illumination, when the rods are starting to work. Somewhere, I’ve got a book on optical illusions…. But my dilemma is WHY I arrive to the opposite secuence? What I’m doing wrong? As I said, I do not understand human visual response; you could easily understand it better than I do. But given that you do not get the right answer, I would say three things. Perhaps I misunderstand them, but they seem to be saying that XYZ cannot be associated to a unique color, that the 1931 CIE does not model the human visual response to a stimulus. to see how they did it. In particular, they did their own color matching experiments to study this effect. That is, they did not use the CIE.
Three, you might go to the newsgroup sci.engr.color where there are real experts. Thank you again for posting the question. I’m sorry I don’t know enough to answer it. I do read the color newsgroup, so I’ll see whatever you get out there. How to implement the block-DCT compression algorithm and how to investigate the relation between the quantization scale factor and image quality (using mean square error and structural similarity “ssim” measures). You have done a fantastic job by posting this article and by reading this article I think I have finally found a veteran of color technology. During last few months I had been struggling with different concepts in color systems. Actually I am designing a color sensor for liquids for my project and being an engineer I have lots of difficulties tackling some mathematical issues. Lately I have encountered a problem. For calibration of my sensor on different industrial regulations I read the regulation on Rosin color scale D509 and wanted to implement it. Now the point is that you know the path length of fluid affects the color in general. The longer the path length containing solution the darker would be the appearance. Now I have the values of xyY (chromaticity coordinates) for 22.6mm path length. If I want to get the values for 10mm path length by doing some maths I know that the values of spectral reflectance Y would change as per Beers law and should look like Y^(10/22.6). But the question is that how do I get to the new xy values after calculating the new Y under 10mm path length. Is there a mathematical way. I know that x=(X)/X+Y+Z, but could we solve this equation to get corrected xy. And secondly am I even right about the fact that changing path length should change xy and not only Y. Please help me, I am screwed by this. I hate to say it, but the problem you’re describing is utterly new to me. I can’t help you. You might post the question to the USENET newsgroup sci.engr.color . And you might search other newsgroups to discover if people have talked about this kind of problem. No problem, lets keep it simple. If I have a value of xyY, and then due to some reasons I change the value of Y. Is there a mathematical relation to get the new values of xy depending on the updated value of Y. Can you tell me mathematically. Y = 3.13, 9.00, 19.77, 36.2, 59.1, 90.01 .
they are black, 4 grays, and white. the only plausible prediction from that data is “xy = constant, independent of Y”. No, i’m not saying that “the” function is xy = constant — i’m saying they’re independent of Y. Now, if you change something else, maybe xy depend on that. That was it. I got the point. But I guess thats the beauty of trichromaticity representation that changing Y doesnt affects xy. I think its the denominator factor that nullifies the effect when changing from XYZ to xyY. This would really help me to proceed. Although you didn’t ask a question, I thought of one. Did you mean to hold X and Z constant? y = Y / (Xo + Y + Zo). I can’t say that the resulting curves look very useful to me, since they all run in a NNW to SSE direction, but maybe you see something. OK, this discussion is far from my expertice, so I not only approached the edge but willingly flung myself into the Grand Canyon. I have unravled 50% of my challenge which is to extract xy from RGB but I am stuck on the other half. I also need to extract luminance (in cd/m2) from RGB and have found plenty of information but nothing definitive. Is it possible? If so, how? Any help would be appreciated. I don’t think you can recover an absolute intensity from RGB or XYZ, but I’d be happy to be shown wrong. That calculation shows that if we took a half-intensity source (or a half-intensity reflectance spectrum) then we would get exactly the same XYZ. If different intensities lead to the same XYZ, we can’t very well recover the intensity from XYZ. You could, I suppose, be asking a simpler question: given xy, how do I recover XYZ? The answer is that you must know one of X, Y, Z… it is customary to supply Y, and then we can get from xyY to XYZ. Thank you for your reply. My project is to measure a light source and the prefered instrument (due to $$$) is a camera that can extract RGB measurements. I need to report color (in xy) and luminance (in cd/m2). From what I’ve read it does not seem to be possible with any accuracy and repeatability. If you can look at a copy of Giorgianni and Madden “Digital Color Management, Encoding Solutions”, 2nd ed, 978-0-470-51244-9, chapter 5 discusses going from a camera to a monitor. I don’t believe it will solve your problem, but it might give you some ideas. For conversion form CIE xyY to XYZ. how much should the value of Y be considered? or better to say what are the possible values, do you know any references for this? one more question : if we compute the center of the rgb triangles for different rgb , whould it be the reference white for that specified rgb triangle? These are good questions. I’d have answered sooner if I had had easy answers. First, plausible values for Y can easily vary by a factor of 100: we might set Y = 1 or Y = 100 for the white point. That is, for some purposes, Y has no physical significant, but is a scale factor. If we go the other way, from an illuminant and a reflectance spectrum to XYZ, Y may have physical significance – but I’m not sure. For me, much of this is just linear algebra. I need the CIE color matching function with 1nm intervals, but the only think I can find on the net is the matrix with 5nm. May I ask you to help me and guide me to a website or a book where I can find it. The 1-nm tables can be found in Wyszecki & Stiles “Color Science” pp.725-735 (see the bilbliographies page). I’m doing optical testing on colorful LEDs. I noticed that the Cx and Cy for blue LED goes beyond the gamut. The values are 0.136,0.0216.. I have repeated my measurements few times..But I’m getting the same results.. I’m not sure whether it caused by the LED or the testing software problem?..Is it possible to have coordinates beyond the gamut? ?..Please advice me on this..
I’m sorry for the delay, but if I’d known an answer for you, I would have put it out quite a while ago. By now I hope you’ve gotten help elsewhere. I can find an assertion (Giorgianni & Madden, p 15; see my bibliography) that the x,y chromaticity coordinates of all physically realizable color stimuli must lie within the boundaries of the chromaticity chart, I find it plausible but I have never proved it. That said, we’re talking about “the standard observer”, so I have to wonder how your measuring device was calibrated. And exactly what computations does it do to get x,y from what it actually measures? I suggest is that you talk to the manufacturer of the measuring device. thank you for your reply.. I also have doubt on the calibration of the blue reference LED in the measuring equipment. Anyways I just want to confirm whether it is possible to have the color coordinates beyond the gamut..thank you very much. I’ll contact the vendor as soon as possible..
Alas, I do not read French. English, German, Latin, or classical Greek? On second thought, let’s not try modern math in classical Greek. On third thought, let’s rule out Latin, too. I do not understand the purpose of either of these comments. Unfortunately, I do not read French.